The OLk Converter software doesnot requires Microsoft outlook in the PC for its working. 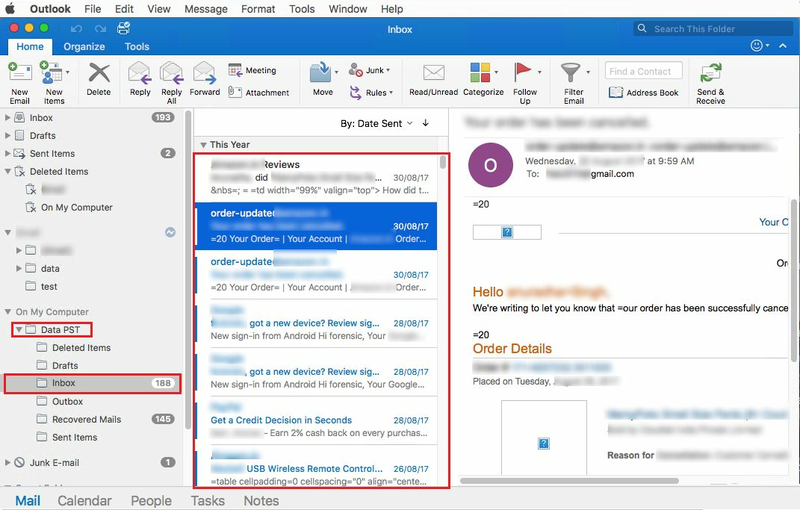 OLK Message conversion can be done with or without Outlook account. 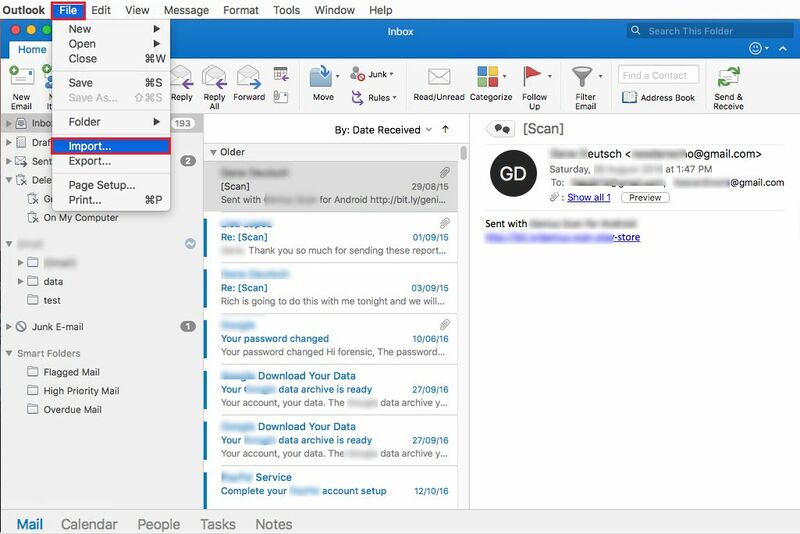 OLK files created by MS outlook for MAC OS and the user can not easily open and read the OLK14message file. 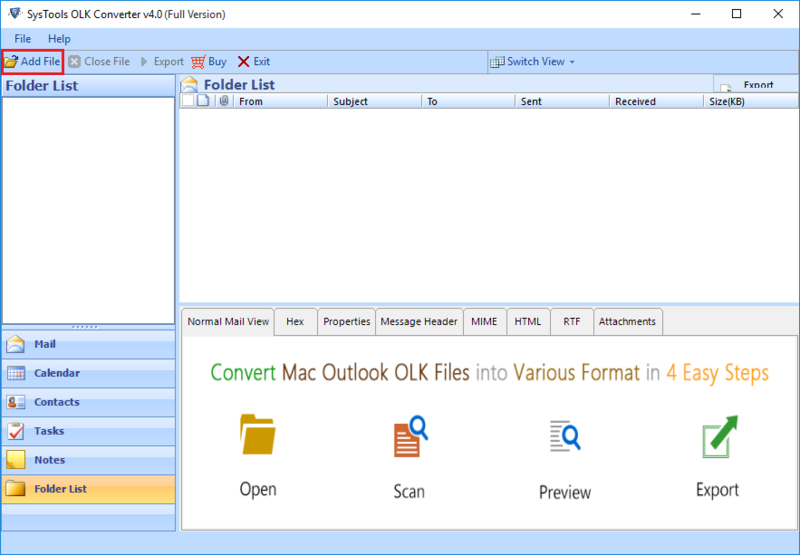 This OLK convert tool converts OLK file To Outlook PST format. This solution helps the user to read and open the OLK15 files in Windows as well as MAC OS. GmaiOLK file converter provides the best way to transfer or convert the OLK14Message to MSG & EML. The tool has the ability to move the Mac OLK file to EML & MSG format. The OLK file converter also maintains the Hierarchy structure. 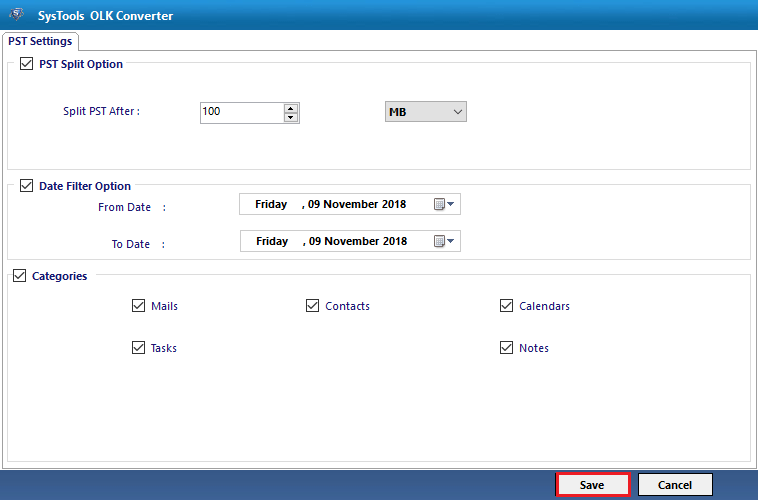 Date based filter is also provided by OLK converter for selecting the file according to date. User have to enter only ‘To’ and ‘From’ date to mark which set of data need to be transferred. The Olk14message converter specifically converts those data from OLK to PST. The OLK Viewer provides naming convention option while converting Outlook Mac OLK15 to PST, PST & EML. The Users can add the file name according to his/her choice to save the output. OLK file Converter keeps folder hierarchy structure of the .olk file, .olk14msgsource, and .olk14message files. 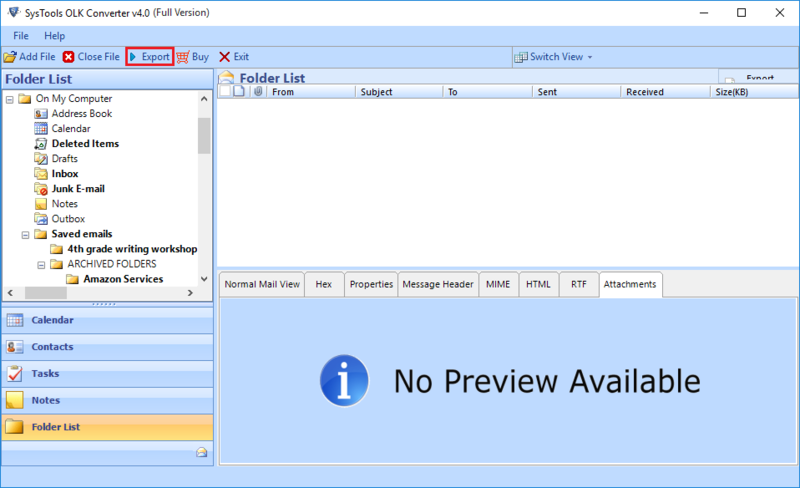 This tool provides the same interface as Microsoft Outlook interface along with the folders like Mail, Address Book File(names, addresses, organization data, etc). OLK14Message converter gives advance Search option which helps the user to search any information by different properties like Subject, To, CC etc. 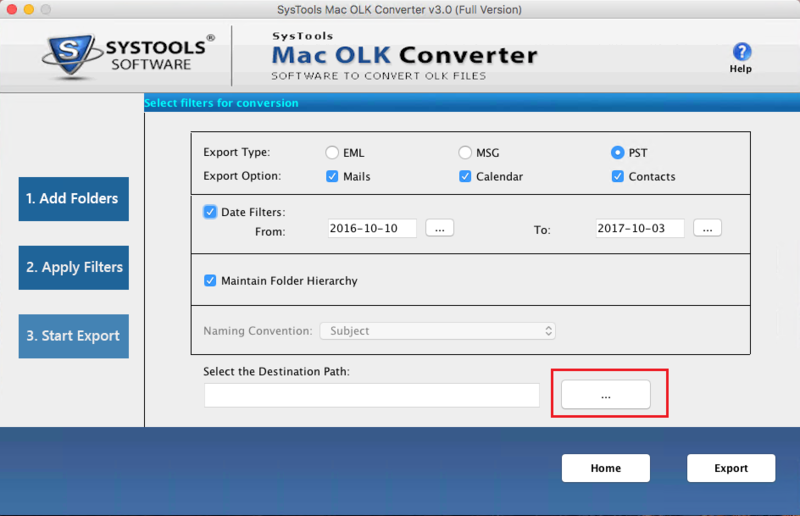 This OLK Converter Tool gives two advance options to convert OLK14message files according to different categories: Mails and Calendars. It provides selective options to convert the OLK14Message file to PST, MSG & EML format accordingly. 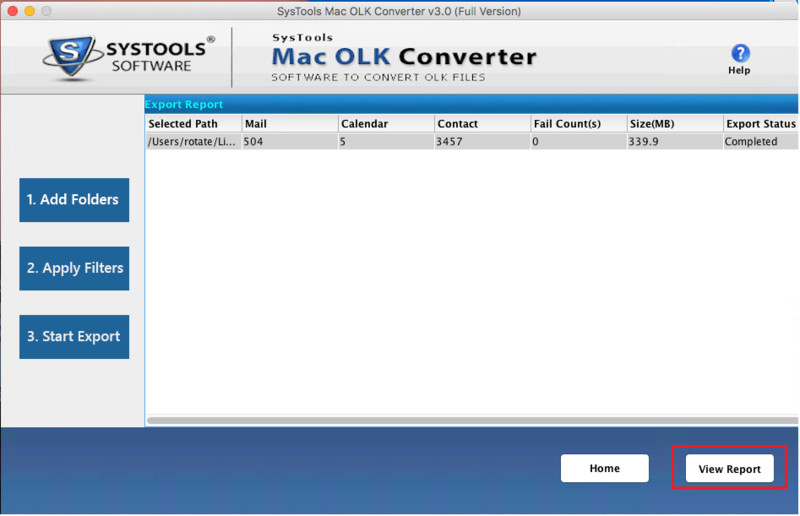 Step 1 : Install the OLK Converter in Your Machine then Run the OLK Converter software and click on Add file button. Add File - This option Export the one DMG File for convertion. 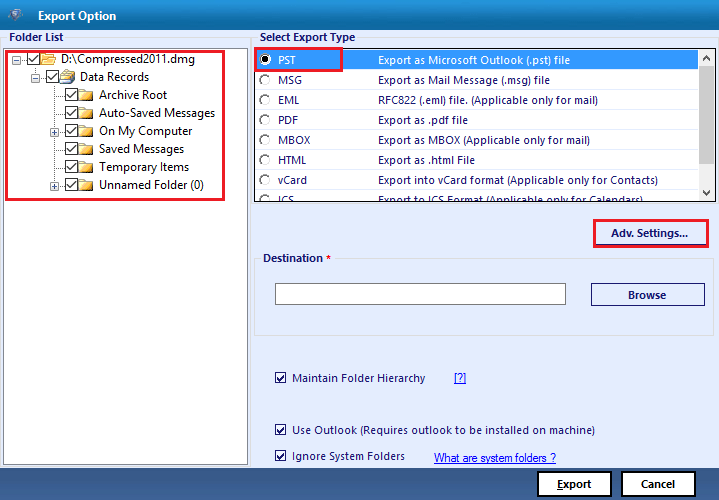 Add Folder - This option allows to convert numerous OLK File from Mail Identity Folder. 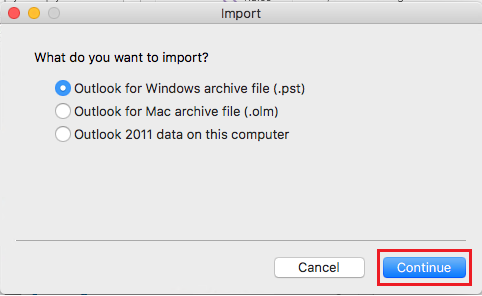 Step 3 : Choose the required file & Select the OLK14 file to be converted & Click on the Export button from the navigation bar. Step 4 : This OLK14Message Converter will show all folder in the folder list section. 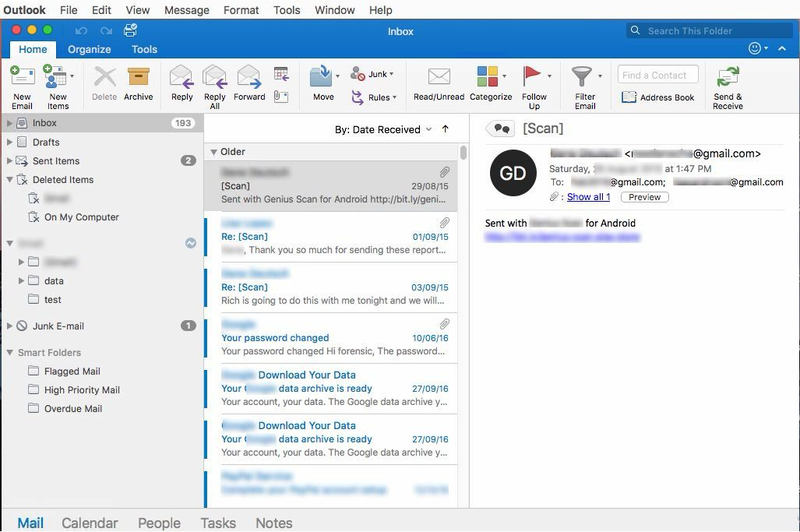 It also provides option to view emails in 8 different formats. Step 5 : Select Export from the top right corner of the OLK converter software. Step 6 : Select Export Type:- Choose the file type in which OLK15 messages need to be changed; i.e, OLK to PST, MSG, EML, PDF, MBOX, HTML, vCard, ICS and Office 365. Step 7 : Consider PST file as the chosen option. Select the advanced settings option to select Split PST, Email Filter and to selct category selection. Step 8 : Select the destination location to save the the converted OLK files in PST file format. And then select Export button to convert OLK files in PST. Step 9 : You will see the window showing the export process successful. After completing the data transfer you can view the Export Report for the conversion process. Q. Can I open OLK files in OLK Converter ? 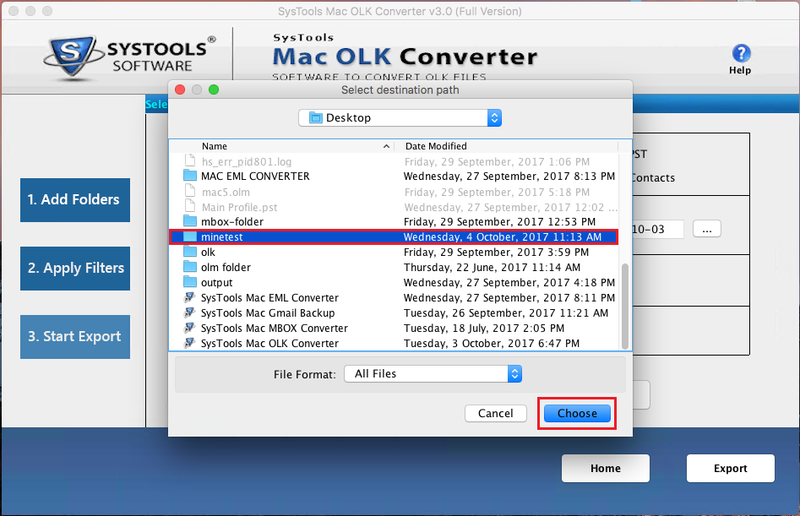 “After seeing the features of the olk converter tool, I am not sure on opening OLK files in OLK Converter"
Ans: Yes, you can easily open or view the OLK14Message files in OLK file Converter software. Q. Can I save my OLK14Message to Outlook PST format? 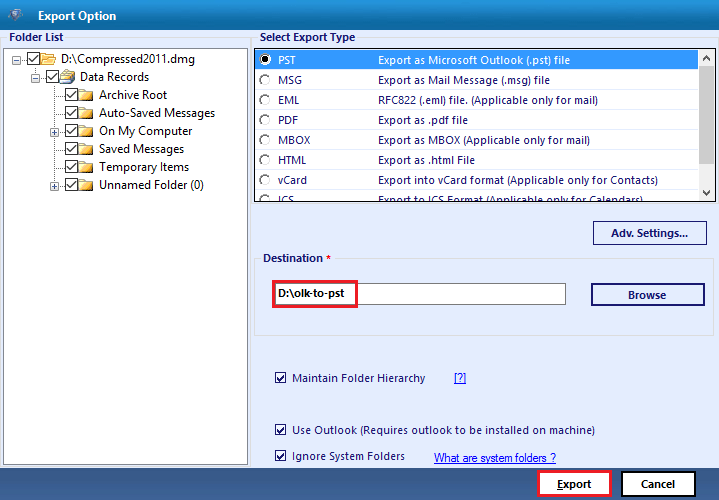 Ans: Yes, You can transfer and convert OLK14message file as outlook PST, MSG & EML file Format. Q. 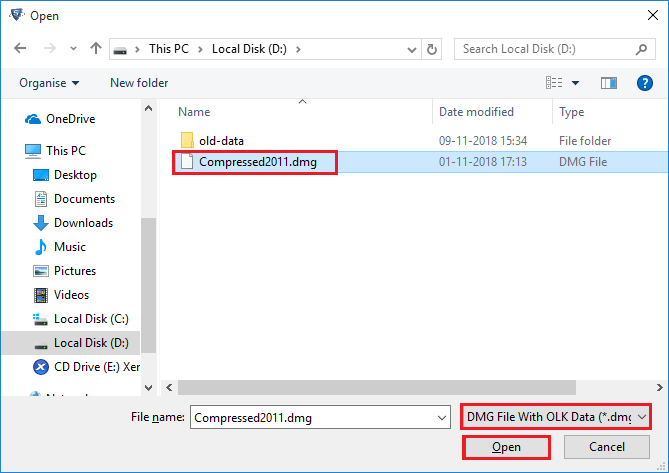 Can I open the OLK14Message file without Outlook Installation in Machine? "I have not installed Outlook on my machine. Will this tool still work?" 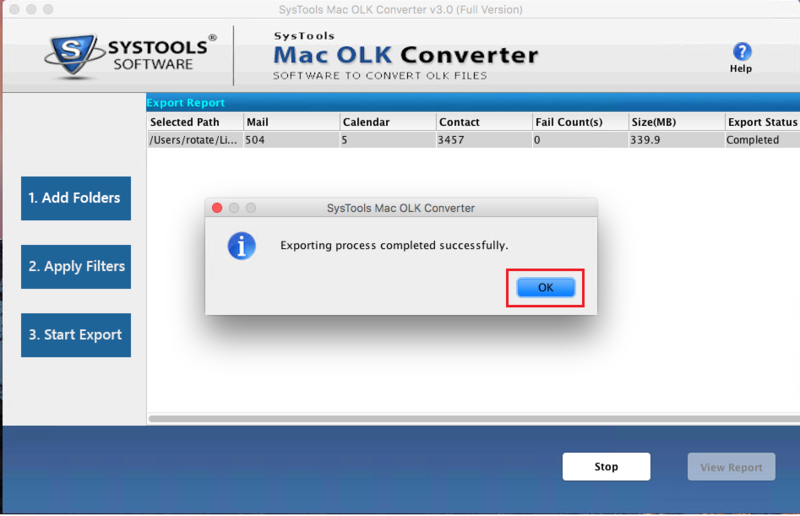 Ans: Yes, OLK converter doesn’t require Outlook to view .olk & .olk14message file. A user can easily read .olk files in original format. It helps to sort data according with this different naming conventions like : Subject , Subject+Date(DD-MM-YY), From+Subject+Date(YYYY-MM-DD), Date(MM-DD-YYYY)+Subject+From etc. The tool easily performs the conversion of OLK14/OLK 15 files to PST/EML/MSG format. It extracts and transfers data from OLK files like mails, address books and calendars. 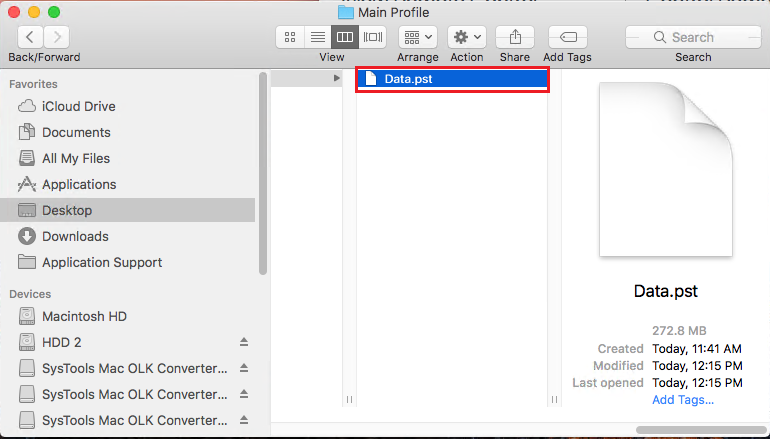 The utility even makes sure that the contents of the file remain safe even after conversion. Mac OLK Converter software provides users with option to add & import .olk14/.olk15 files into PST/EML/MSG. It does not impose restrictions in migration process & makes browsing multiple files possible. It provides Add Files/Folder button for browsing OLK files in bulk. The program comprises of simple, pocket-friendly, & interactive interface. It offers the users with such comfort zone that it eliminates all the problems in Mac OLK Conversion. The software can be considered as best in terms of conversion as it does not need help. Mac OLK Converter wizard provides users with employable solution to selectively transfer all files which contain mails of a particular date. All the users need to do is select particular time slot i.e., ‘From’ and ‘To’. Tool easily filters out messages from searched OLK files. Using the tool, users can make themselves comfortable and import OLK files easily. Software even offers numerous file naming convention option to save files with desired names. By this option, users can import olk14/olk15 to PST/EML/MSG message in easier way. Mac OLK Converter provides users with OLK folder hierarchy maintenance guarantee. It means that the software is completely preserving the folder structure in exporting files in it. It makes the conversion process an easy and employable task. Step 3 : Note: The procedure follows same for all file Formats i.e., PST/EML/MSG so, we are taking OLK to PST Converter as a reference. Step 7 : Export Process will be completed now. Step 8 : Click On View Report for the export report process. Step 9 : Afterwards, navigate and then select the final CSV file. Step 10 : Export Process will be completed now. 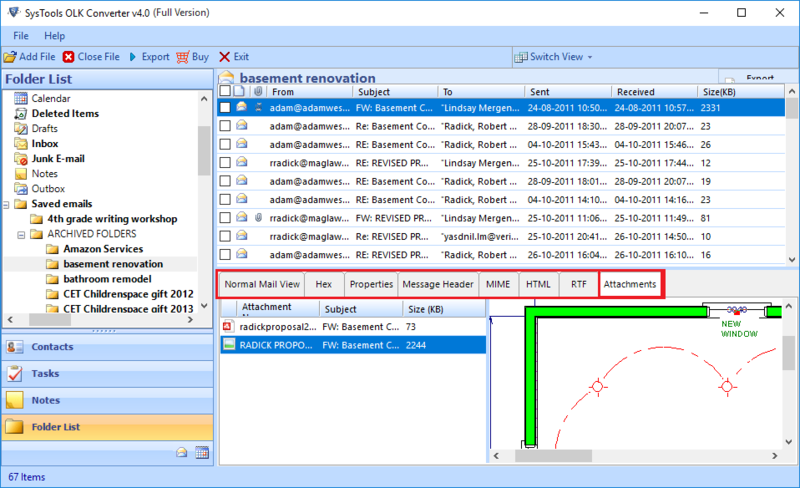 Step 11 : Migrated PST files are displayed at a particular location. Step 12 : To access PST files, open MS Outlook in Mac Operating System. Step 17 : Now, a separate label with name PST file is created. Finally, the data in Outlook PST file will accessed as follows. Watch!! How to Export Mac OLK to PST? Q. Does the Mac OLK Converter Wizard provide technical help in terms of any chaos? "I have downloaded the product and I am trying to access it but unfortunately I am not able to succeed as I am not technically sound. I want help for technical team. Please suggest me something." Ans: Yes, the application comes with round the clock assistance that can help the users for performing the task of migration in an easier manner.Thus, can take them out of problems faced. Q. Does OLK Converter ensure no data loss after the migration process is over? "I want to make sure, does the software maintain the data after converting files as I am really scared. I don’t want to lose data at any cost as it is very crucial. So please tell me, does the software retain the data?" Ans: Yes, software maintains in keeping the promises intact in performing data migration between two platforms. Thus, you need not to fear about the data loss. Q. Does the software provide naming conventions option for performing convert OLK files to PST? "I have few OLK files in my system. 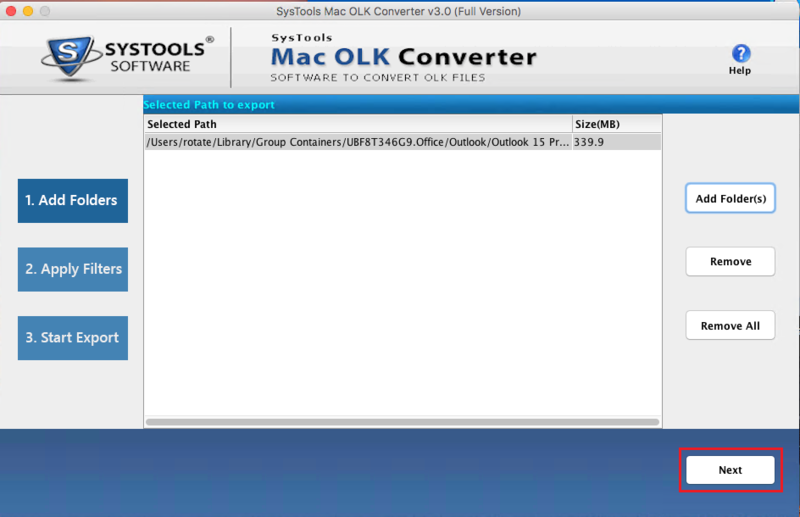 I want to import OLK to PST because I am using Outlook for Mac now. So, please confirm that does the software performs the same or not?" Ans: Yes, utility offers users with multiple options like email filtration on date basis, file naming conventions for performing migration. Q. Can we transfer OLK14 Message and OLK 15 Message to PST in batch? "I have many OLK files stored in my device. Now, my Manager wants me to convert all the files to PST in limited time. So, tell me is there any provision to perform the same?" Ans: Yes, employing the wizard in your machine, you can bulk move OLK14 and OLK15 message files to Outlook PST without turbulence. Thanks Developers for this brilliant program. I really want to appreciate you guys for your brilliant effort. The designed products are simply marvelous. I want to appreciate you guys for your invention. I am really grateful to the developers who have designed such a tool. This utility has just changed my perception about technologies. 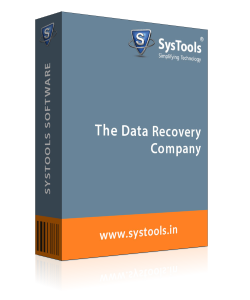 The software is completely reliable when it comes to data migration. Thanks developers for such an amazing program. You guys are just wonderful and take technology as an integral part. Once again let’s together cheer up for the product and wish you all the best for future endeavors. I solely want to say thanks to you guys for this brilliant application. I would recommend each one of you should make use of this product. You guys are doing great work. Thanks for your help.